Jurgen Klopp does not believe Manchester City will be worried if Liverpool beat Bournemouth to take over top spot in the Premier League - particularly as their lead may only last for a few hours. The Reds are involved in the Premier League's early kick-off on Saturday and travel to the Vitality Stadium knowing a win will see them move above Pep Guardiola's reigning champions in the table. Even if Liverpool win, City will have the chance to return to the summit when they play at Chelsea later the same day, though Klopp's only focus is making sure his side find a way to overcome their hosts on the south coast. The German has been impressed by Bournemouth this season and praised the work done by opposite number Eddie Howe during his pre-match press conference on Friday. "I don't think they feel any pressure. They don't look like that," Klopp said of Guardiola's City. "That's not the first target - the first target is to try to perform at the highest level because it's needed at Bournemouth. They are having a fantastic season, Eddie is doing an outstanding job there. “But of course I know every single player knows about it. I don't have to mention it, it's clear. It's a tough one, Bournemouth is in a good moment. "Even if they lost a few games, we saw the games and it was always really hard work for the opponent. They are so well organised and so good in the counter-attacks, full of confidence. "The strangest game was against Huddersfield. Huddersfield played a really good game and gave them a proper game but still lost, Bournemouth won. "It's a big job to do. Being top of the table would be nice, but it may only last a few hours." Jürgen Klopp has been shortlisted for the @premierleague Manager of the Month award for November. Liverpool stretched their unbeaten league run to 15 games this season with an impressive comeback against Burnley on Wednesday, recovering from a second-half deficit to triumph 3-1. 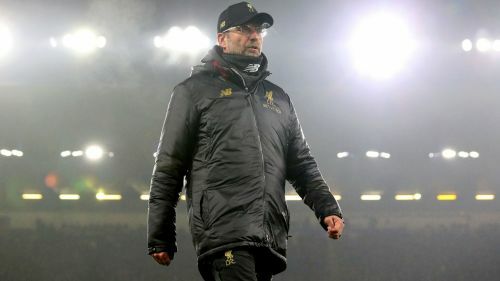 Klopp was particularly pleased with the display at Turf Moor, with his players demonstrating their mental strength by overcoming the setback of conceding the game's opening goal. "So far we showed consistency, which is the most important thing. If you reach a specific level, to improve on it or even stay on it, you need consistency," he told the media. "That's what the boys do, they are ready for all of the problems in a football game so far. "We stayed in the game in all of the games, and fought back like at Burnley. It's a tough place and being 1-0 down is usually a sign for something special for Burnley. We stayed really calm and used our moments with fantastic goals. "It's a good example for the season so far - whatever happens in the game, believe in your own tools, believe in your own strength and use them. That’s what we did." The only downside in the win over Burnley was an injury to Joe Gomez, with the defender suffering a fractured left leg that will keep him out for up to six weeks. Klopp also confirmed he will be without centre-back Dejan Lovren for the fixture at Bournemouth, meaning Joel Matip is likely to continue next to Virgil van Dijk at the heart of the defence.